So much easier when you know where the save function is! I completed Dear Esther, and managed to do some comparative different routes to the final scene too. Notice the singular there, you can’t change the ending of this story, or at least I’ve not discovered an alternative ending. And now I can read the other online comments about the ending, it doesn’t appear anyone else has either. The Save function did allow me to explore the narrative structure in more detail, and what I observed in my previous post was confirmed, though there might be diversions from the main narrative path, they are but small distractions that will loop back to put you somewhere close to where you left the main story. You might hear a different narrative segment depending on the paths you take, but it won’t change your constructive interpretation that much, and you are also likely to hear the same segment on different routes through the story. The strengths of Dear Esther are its atmosphere and sense of place. Which isn’t surprising, as that was the aim of its creator(s).Dan Pinchbeck, the game’s original author was researching presence (see below) when he wrote it. I didn’t comment before on the exquisite soundtrack, both effects and music. When there’s no music playing the sound of the wind, the water and the echo of your own footsteps, maybe even snatches of a (your?) voice, all contribute to a suitably spooky atmosphere for a game wherein you are on a deserted island where somebody has been lighting and AWFUL lot of candles. But when the fabulous music kicks in your engagement in the scene suddenly kicks up a gear. Its funny isn’t it, that apparently ADDING to the mediation – music, magical takes on reality – seems to have to opposite effect to what one might presume, it can distract you from the medium, and immerse you in that narrative. Well, I say its funny but I expect better minds than mine have already unpack and explained that effect. I’ve got a a lot a reading to do, starting with Pinchbeck’s academic work, now that I’ve played his game. Yesterday I attended the inaugural meet-up for developers around the Southampton area. The focus for the group is currently on those that use, or are thinking of using, the Unity 3d engine. This is all new to me, but reading about it on the web I was surprised by how many games I’d played or heard of were built with the Unity engine: Temple Run 2 and Bad Piggies are just two examples (and the last is interesting, as its essentially a 2d game – but as somebody explained last night, you just make the objects flat and fix the “camera” to look at them dead on, then you can take advantage of all the maths and effects available in Unity). The evening was put together by Alister Lam of Frugal Spark, who apart from being a genial host, demonstrated how easy it was to get started building a 3D environment in Unity. Finishing with a couple of demo Augmented Reality apps, where the iOS device recognised a picture and built a 3d scene around it (so for example, a picture of a dinosaur came to life, stomped over a landscape and gobbled up some smaller prey). This obviously has possibilities for cultural heritage, and made me think what a device might show when pointed at (say) some of the nationally important but domestically displayed pictures at Polesden Lacey. Then he handed over to John White, Managing Director of 4T2, who gave a presentation on “how Lego and Unity changed our lives.” It turns out the 42T were behind most of my kids’ favourite online and iOS games, including CBBC’s Beakeriser, and loads of Lego brand games. I also spoke with Steve Longhurst of local coders Finblade, and Nick Thorne of Winchester Innovation. Nick showed me a tidal prediction app his company have been working on. The meet-up was at The Point, an arts centre in Eastleigh, and Alister mentioned that he was working with the council on the idea of creating a digital creativity hub there. That excited me because of the work I’ve already seen coming out of Watershed, in Bristol. That Cultural cinema and digital creativity centre is home to companies like Splash and Ripple, and a key player in the REACT hub that funded projects like Ghost in the Gardens. 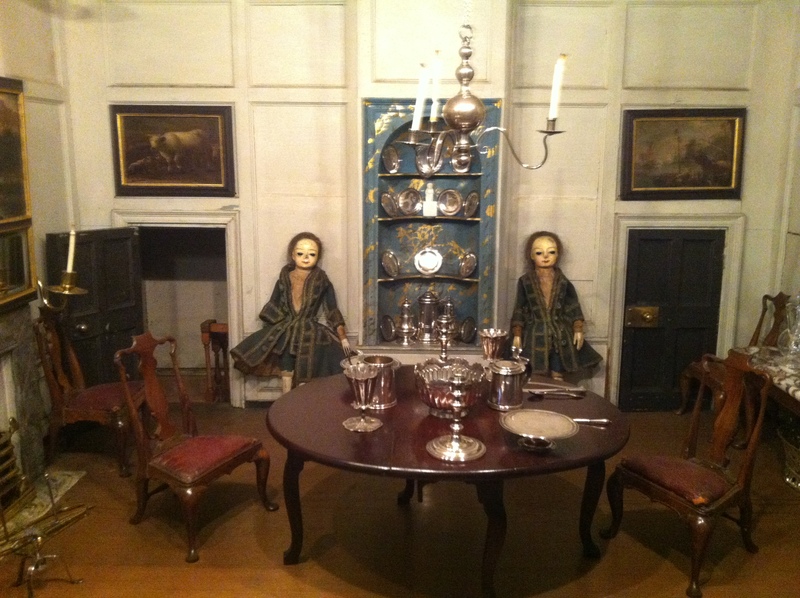 At Uppark there is a rare example, intact with original dolls and furniture, of an early Eighteenth century Dolls House. Though smaller than Queen Mary’s famous Dolls House at Windsor, it may be just as significant because of its age and completeness. The National Trust don’t currently think they do justice to this important part of the collection, and are starting a project to understand it more completely, and display and interpret it better. We met a few days ago and discussed what research needed doing, how it might be better dsiplayed and, in general terms, how it might be interpreted. It struck me that the assembled curators, conservators and other specialists were talking about all sorts of things that might be done digitally, so afterwards I spoke with the manager at Uppark to discuss whether the project might include a digital element from Southampton University. She was very open to the idea. We think this was less a child’s toy than a training tool for young ladies who needed to learn how to manage households. This sparked an interesting though from my wife when I was talking to her about it. She pointed out that the modern equivalent is the Resource Management Simulation games, that were once seen only as text based training tools for education and industry, but later became popular in commercial games like Sim City, Civilisation, Railroad Tycoon, The Sims or even the Simpsons Tapped Out touch game. We wondered whether there was a digital way of interacting with the Dolls House and moving the fragile Dolls (the Gentry have wax heads the servants are wooden – in one room a wet nurse tends two babies in a crib, one waxen, the other wood) from room to room and task to task, to simulate the micro economy of the sort of household that the Dolls House is meant to represent.